The Joint Seat Allocation Authority (JoSAA) 2018 will be releasing the result of the second round of seat allotment tomorrow, on July 3, as per the official website — josaa.nic.in. Once released, students will be able to check the same through the website for admission into IITs, NITs, IITs and other GFTIs. The first round of seat allotment was published on Wednesday, June 27. Candidates who will be allotted seats will be required to pay the seat acceptance fee (through SBI e-Challan/ net banking/ debit cards) and get the documents verified at any reporting centre for provisional seat acceptance. JoSAA will conduct total seven rounds. About 36,000 seats are available in 23 Indian Institute of Technology (IITs), 31 National Institute of Technology (NITs), 23 Indian Institute of Information Technology (IIITs) and 20 government funded technical institutions (GFTIs) are offering admissions to the students this year. Step 2: Remember to fill your choices of institutes and branches in decreasing order of preference. Step 4: Once done, the candidate must ensure to lock their choices. Withdrawal option is not available after seat acceptance and document verification period of round 6 of seat allotment. 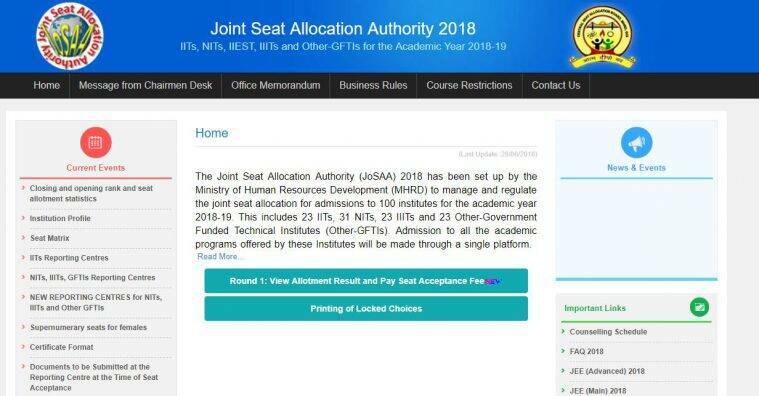 The Joint Seat Allocation Authority (JoSAA) is set up by the HRD Ministry to regulate centralised admissions in premier engineering institutions will publish JoSAA 2017 mock allotment for the registered students.